Stay in Gunnison, ski Crested Butte Mountain all for the cost of one lift ticket anywhere else. Sunny Gunny, as many locals call Gunnison, is a college town meets ranching community and just 30 minutes and no stoplights away from Crested Butte. The Gunnison Getaway starts at just $68 a person and includes discount lift tickets to Crested Butte Mountain Resort and lodging in Gunnison. From boutique inns to reliable hotel chains, accommodations are affordable and welcoming. Cuisine ranges from authentic Nepalese food, Mexican, Thai, plenty of pizza joints and a local brewery. Free buses run up and down the valley each day, so staying in Gunnison and skiing Crested Butte doesn’t require a car. 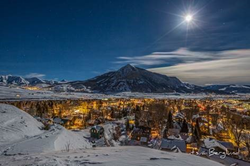 Crested Butte boasts a fun and chill après ski scene. Uley’s Restaurant at the Ice Bar is a must visit while skiing the slopes at Crested Butte Mountain Resort. Grab a bar-stool and hunker down with your brew on the ice block that makes up the unique, solid-ice countertop. Grabbing a warm drink and a seat on the deck is always a good idea. Panoramic views of the West Elk Mountains surround skiers as they kick back on Adirondack lounge chairs. It’s a perfect way to relax before heading down for your last run of the day. Fly non-stop to Gunnison-Crested Butte (GUC) from Los Angeles, Houston, Dallas, and Chicago for $149 round-trip. Some date and other restrictions apply. For more information and to book travel call (877) 586-4240 and speak with a Gunnison-Crested Butte local.